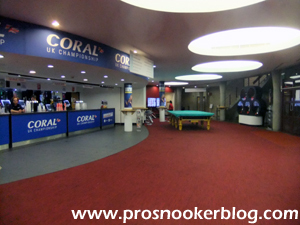 Down to the last 64 at the UK Championship as the BBC and Eurosport begin their live coverage of the event from here at the Barbican Centre. 15:25: Following the hectic three-session days earlier in the week, we are now down to just two today, with the sessions getting underway at 1pm and 7pm respectively. Arriving at the venue early in the afternoon, I was in time to see Jimmy White take the opener against Ding Junhui, taking a seat in the media room before quickly being asked to move as I was blocking Rob Walker’s view of the match. And it was some match early on, as Jimmy and Ding were to become embroiled in an engrossing second frame. It eventually came down to the black, an epic safety duel going on for what felt like at least 10 minutes with neither player having a shot at it, before Ding played a table length double up into the green pocket to draw level. It might seem early to call the second frame a turning point in a best of 11 frame match, but to those of us watching in here it certainly felt like it was an important frame for Jimmy to win and Ding was to strike another blow by taking the third frame on the black with a clearance of 46. 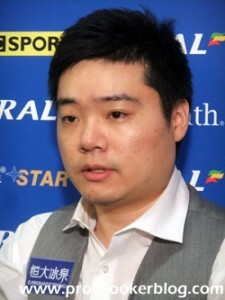 At the time of writing, Ding leads 3-1 at the mid-session interval, while Marco Fu has just become the first player to make it through to the last 32 with a 6-1 win against birthday boy Lyu Haotian, making three century breaks along the way as he looks to make it through to the UK final for the first time since 2008. 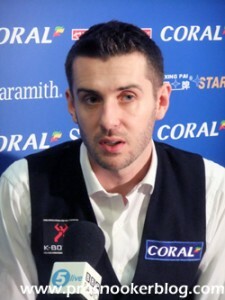 One big name who does look to be in some trouble is Mark Selby, who trails Irishman 4-3 as I write this blog. 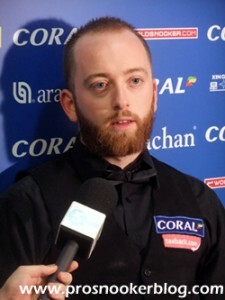 Having regained his main tour place at the start of last season, Morris has produced probably his best form as a professional during the past 18 months and it is good to see him showing what he can do out on the main table today. Another player who could find himself in danger today is John Higgins, the Scot having struggled for form during recent months and currently locked at 3-3 with Jamie Cope. Regardless of Cope’s recent struggles, it is a tough match for Higgins at the last 64 stage, after all who can forget their dramatic last 16 match at the Crucible back in 2009? 17:41: Today has been one of those days where all of the matches have finished at once and we have also had our first big name casualty of the early rounds, with world number one Mark Selby being sent home by Irish number three David Morris, who won their match 6-4. As Selby got back into contention at 4-4, there was a feeling that we were about to witness a trademark Selby comeback, but every credit to David who as Mark described during his post-match press conference, raised his game following the mid-session interval. From Selby’s perspective, he did not seem overly disappointed following the match and spoke of how his year could not have been any better, given his World Championship success earlier in the year and the recent birth of his daughter Sofia Maria earlier this month. He will not be in action now until the German Masters qualifiers next month and will surely be looking forward to spending a few weeks with his family. “Probably just a little bit of calmness in my life, not that it was ever crazy or anything but I am just a little bit more confident in myself on the big stage. “I would have to say with the tour and the way it is now, you do get to play a lot of the top guys, all the time now. 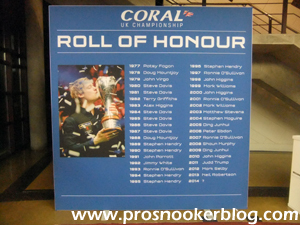 Everyone is improving, even the guys that have been on the tour for 20 years, Mark Davis, Stuart Bingham, they all went up, their standard shot through the roof once the PTCs come in because they were playing all the time against the top guys and they became the top guys. I think that helps the younger players, the newcomers and people who have been let’s say journeymen, to push on to be really good players. David’s comments are reflected in his results during the past 18 months and this is another result that will help him to establish his place up inside snooker’s top 64. For Selby, the victory does confirm that he will lose the world number one ranking after the tournament, dropping to third or fourth depending upon O’Sullivan’s progress, although when asked about this following the match he clearly was not unduly concerned by that. The battle for number one now is therefore between Ding Junhui and Neil Robertson, Ding coming through a 6-2 winner against Jimmy White to boost his own hopes. 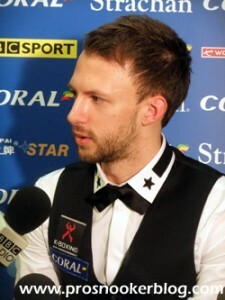 As I have commented before, Ding’s English has improved beyond recognition in recent years and it was good to hear him speak of his progress in the tournament and of the increased depth in the card, while there was also a nice line on Mark Selby, who he said must have been busy with his little baby recently! 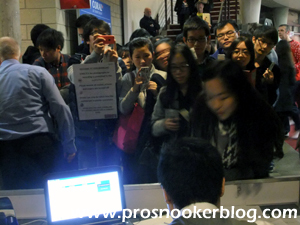 Perhaps Ding’s toughest task was yet to come however, as he commandeered the tournament desk just outside of the media room in order to conduct an impromptu autograph signing session with the many Chinese fans who were in attendance today. It was really quite a sight, and a sound, with the screaming fans more than audible over in the media room! Elsewhere, John Higgins was also a winner, coming through that tricky last 64 match with Jamie Cope a 6-4 victor. 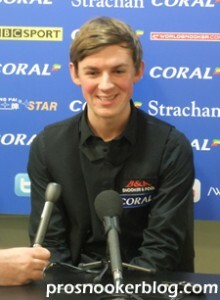 It was interesting to hear him speak after his win about how Marcus Campbell and Graeme Dott had spotted a flaw in his technique, namely that he was pulling the cue back too far on his back swing. He also spoke about being happy to have made what sounded like a trademark Higgins clearance against Cope, the sort that he has not been making regularly during the past two seasons and who knows, perhaps this could be the turning point that he has been looking for. As a side point, I couldn’t resist having a chat with him after the press conference about his Masters chances, John being a player who I have never spoken to previously at any length, but after I told him that I think he will be safe, joked (I think), that he will be after me if he isn’t! Next up for him will be Matthew Stevens, a repeat of the 1998 final when the tournament was staged in Bournemouth and Matthew was also happy to be through, though was unimpressed with the fact that he did not yet know when his next match would be played, preventing him from travelling home tonight if he wished to do so. 21:52: Having typed up the above, I headed on into the sports hall for the first time this week to sample the much criticised atmosphere in there in 2014 and watched a couple of frames of the matches involving Robert Milkins and Graeme Dott. It is a strange atmosphere, with few spectators beyond family and friends and it is not difficult to see why the players do not enjoy playing in there. Of what I saw, neither Graeme or Anthony Hamilton looked to be playing particularly well, while Milkins was winning a few close frames against Marcus Campbell to open up a 4-0 lead by the mid-session interval. Rather oddly I had the company of Mark Allen sat to my left and Stephen Maguire to my right at one stage, both killing time at the venue and Stephen wanting to catch the matches involving his fellow Scots, while as I was there, the partition just behind Graeme Dott’s chair looked to be getting closer and closer to falling apart every time he sat in his chair and leaned back against it. As all of the matches in the hall reached their intervals at around the same time, I headed on back to the media centre to find Mark Williams on the verge of a 6-0 victory against Jimmy Robertson. 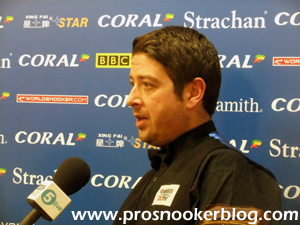 Upon completing what was a 97 minute victory, he came into the media room and like Matthew Stevens was disappointed not to know when he would next be playing, but was otherwise happy with his performance and told us how his main aim at the moment is to make sure of a spot at the Crucible next year, so he does not have to play what he described as ‘the ridiculous three games’ to qualify. “Getting beat! Just sick of getting beat really by people lower down in the rankings. Two or three seasons ago I wasn’t losing to anyone like that and it just got to a point where you get home and you are watching it on the TV and you get sick of it. “So I started to put work in again, practising probably more than ever and I think it is starting to show out there and I’m looking relaxed again. Against any other opponent a couple of weeks ago [at the Champion of Champions final], I 100% definitely would have won the way I was playing, so it took Ronnie playing like that to beat me. The other topic of conversation was his rather snazzy Givenchy shirt, something that has clearly divided opinions, but I quite like and am always in favour of someone trying to do something a little different. Not looking quite as sharp was Glocuester’s Robert Milkins, who was clearly struggling with an eye infection, his right-eye bright red as he told us of how the problem flared up shortly after the Ruhr Open final last weekend and has left him with blurred vision. As he said, the problem has not affected anything so far in terms of his results, but he said that he is starting to lose his timing and sharpness, so may seek further medical treatment prior to his next match. 23:22: Following that flurry of finishes, attention turned to the remaining matches and it looked as though Barry Hawkins would be the next man through as he led Nigel Bond 5-0. The tables have since turned in that clash however and at the time of writing, Nigel is poised to draw level at 5-5. Shades of his famous comeback against Cliff Thorburn at the Crucible, when he came back from 9-2 down to win 10-9 of course. “It is very special, everyone tries to play well in these tournaments and everyone tries to bring their best form to these sort of tournaments, especially the UK but as I say, I have been practising hard and practice does pay off so hopefully I can keep going. 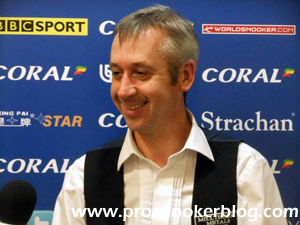 0:53: More updates will follow in the morning due to my need to get home this evening, but from there we saw a genuinely remarkable comeback, as Nigel Bond came back from 5-0 down to defeat world number five Barry Hawkins in the early hours. We also witnessed strong words from Graeme Dott about the format and the conditions, while Anthony McGill and Ricky Walden are also able to come through tight matches as winners.